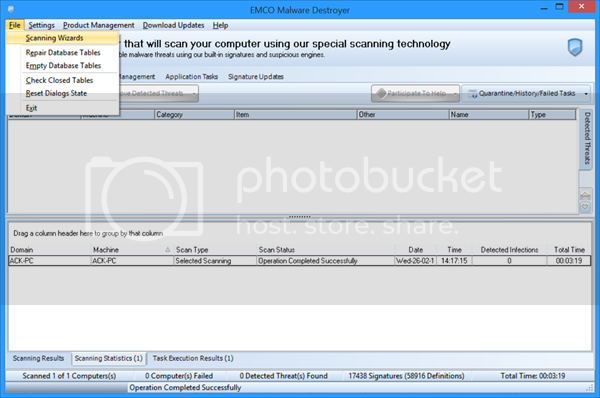 EMCO Malware Destroyer is yet another free second-opinion antivirus with a high-speed scan engine. It helps you to organize personal malware protection and effectively find and destroy various threats. Unique malware scan engine allows you to spend only 10 seconds for complete PC analysis of over 10,000 real threat definitions, including viruses, trojans, worms and other malware types. Up-to-date malware database includes virus information provided by leading virus labs and thousands of users. EMCO Malware Destroyer is yet another free second-opinion antivirus with a high-speed scan engine. Emsisoft AntiMalware (EAM) has got excellent results in tests of antimalware-programs. the only difference is that the free version has no realtime protection. Yes, no denying that. Emsisoft is good. It has already been mentioned on that link.